In photo: Amrita Bajnath-Seepersad, Brand Manager for Mario’s Pizza, shakes TTOC President Mr. Brian Lewis’ hand as she and Nichelle Grey-Smith, Brand Assistant – Mario’s Pizza, present him with the $25,000 cheque. 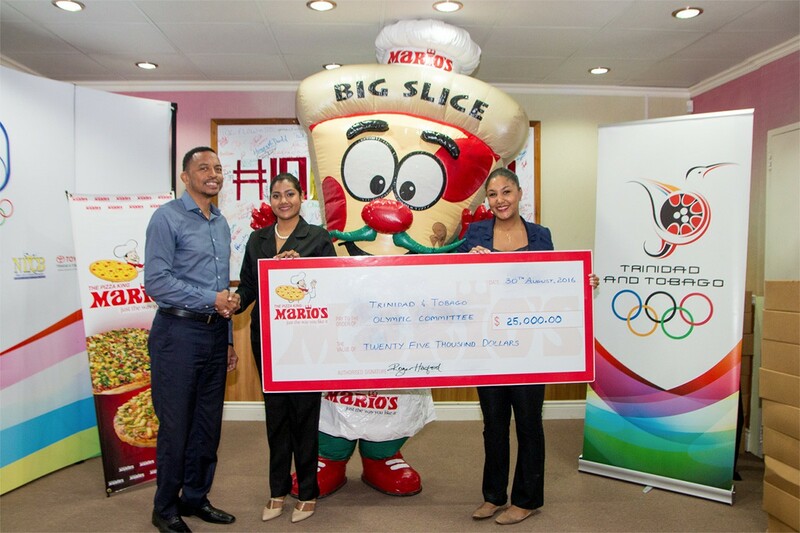 During the recently held games in Rio, Mario’s Pizza was championing the cause for the future of Team TTO with their special promotion from July to August where, with the purchase of every mega meal, the restaurant donated $5 towards Team TTOC – 10 golds by 2024 and the Athlete Welfare and Preparation Fund. Recently, Mario’s presented to Mr. Brian Lewis, President of the Trinidad and Tobago Olympic Committee, a cheque valued at $25,000 representing the donations collected from the July to August promotion. Mario’s is proud to give to this initiative of the TTOC to develop a more comprehensive support programme for our national athletes so that they can be better prepared for international competition, resulting in greater results for the Red, White and Black on the world stage.